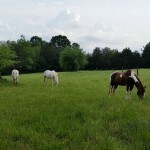 White Rose Equestrian Center is a small private barn in Iron Station, North of Charlotte, NC with an emphasis on fun and safety. 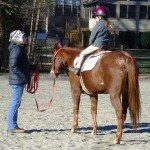 We offer horseback riding lessons for all level of rider. We believe that riders should develop an independent, balanced seat & understand their role in the partnership of horse and rider. 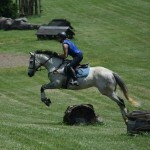 We also offer, boarding, shows, clinics, stable management, & homeschool classes, and manufacture show jumps. 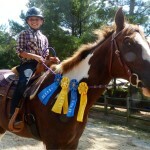 We take your equestrian needs very seriously and tailor our horseback riding lessons to each rider. We teach a strong, confident, balanced seat on lesson horses and ponies that are safe, well-schooled, confidence givers ready to bring out the best in every rider. Our camps are year-round, not just in the summer. 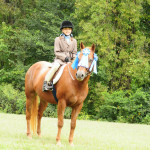 We provide a fun, safe place for your children to learn and enjoy being around horses. 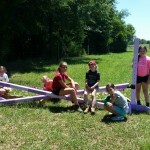 Each camp includes supervised riding, stable management classes, arts and crafts, and lots of fun. Also open to non-riders. We offer full board with dailyturn-out on a beautiful 28-acre property. Boarders have use of the fenced riding arena with sand footing, full-sized dressage arena with screenings footing, large jumping field, and local trails. A cross-country course will be added soon. We don't specialize in horse sales but we often have a selection of horses, ponies, and other critters for sale and/or lease. Our part-time onsite leases are ideal for riders who want extra time in the saddle but don't want to commit to owning their own horse. We run low-key, fun schooling shows throughout the year. If you have considered showing but always felt intimidated or unprepared our shows are perfect for you. We encourage our students to participate and also welcome students from local barns. Our blog is intended to educate and entertain with subjects including general stable management, show updates, tips and trick to improve your riding and much more. It's a great way for anyone to learn the basics behind looking after and caring for a horse.